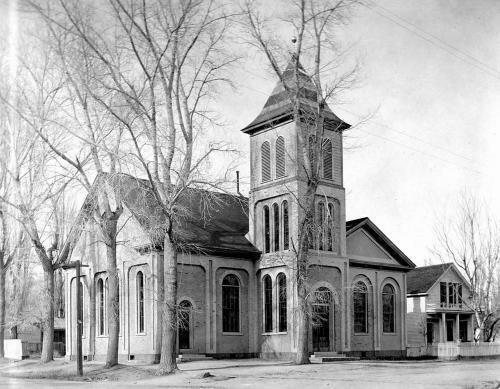 Today we have two photos of Carson City churches. Both these photos are just about a hundred years old, taken at the beginning of the 20th century. They show a Carson City that looks cold, with no leaves on the trees and dirt streets best suited for traveling by horse and buggy. First up is St. Peter’s Episcopal Church at Telegraph and Division. It was built in 1867 by the Corbett Brothers, the same brothers who later built the Arlington Hotel. In this photo it is 40 years old and surrounded by several mature trees and a picket fence. 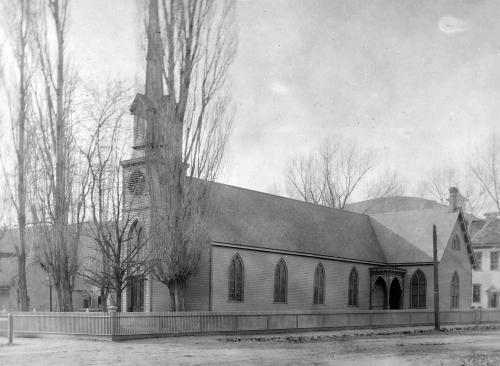 The fence and many of the trees are gone now, but the church still stands, looking almost identical to this picture. The First Presbyterian Church got plenty of coverage in the news a couple of years when it was threatened with being torn down. The building was starting to show structural weaknesses, and the congregation wanted it demolished to build a new, larger sanctuary. Public outcry got them to change their minds, and instead they saved the historic old section and built the new sanctuary right in the back of it. There was no outcry to save the house on the right, though. That was lost decades ago, and the spot is now taken up by a large lawn with the Carson City Christmas Tree in it. This church is known for its connection to Mark Twain. His brother was a Presbyterian, and in the 1860s they had run out of money to finish building the church. It sat unfinished for a couple of years until Twain held a fundraiser to raise enough money to complete it.